Thanksgiving is coming up pretty quickly. I mean, it is just a few weeks away. Now is the time to start working on your preparations for the Thanksgiving Holiday. 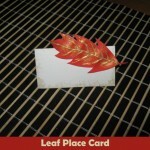 Today I will show you how to make Leaf Place Cards for Thanksgiving. These Place Cards are a simple, but elegant. Your Thanksgiving guests will love these lovely Thanksgiving Place Cards…. so much so that they will probably take their place card home to remember your beautiful Thanksgiving dinner. Let’s get started. What is the most known symbol of Thanksgiving Day? The turkey, of course! Thanksgiving wouldn’t be Thanksgiving without the Turkey. So, with that being said…. 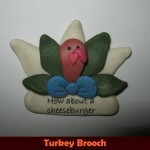 today I’m going to show you how to make a Turkey Brooch perfect for Thanksgiving. What better way to show your love for the Thanksgiving Holiday than to parade around town wearing a Turkey Brooch? So, let’s get started. I have a wonderful Thanksgiving craft to show you today. I’m going to show you how to make a beautiful Thanksgiving card perfect to give a friend or a loved one. 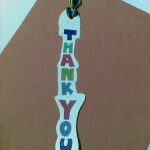 What better way to show your Thanks than to do it with a lovely card. Make a few and give them to all your friends and loved ones this Thanksgiving. 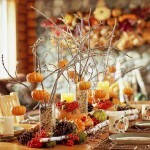 Thanksgiving is just around the corner, but it’s not too late to make a decoration for the Thanksgiving Holiday. Today I will show you how to make a Hay Decoration for Thanksgiving. 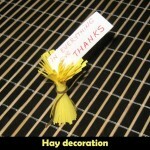 Made out of yellow paper and thick thread this Hay decoration is sure to be a huge hit for Thanksgiving. And, the best part…. you can say you made this decoration yourself. So, let’s get started. Pilgrims are an important part of Thanksgiving. After all, if it wasn’t for the Pilgrims we would have no Thanksgiving at all. 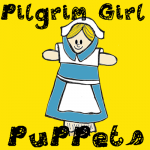 Today I will show you how to make a Pilgrim Girl Puppet perfect for the Thanksgiving Holiday. 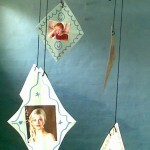 It is a fun craft that you can make out of things that you probably already have in your home…. such as a shirt sleeve, sock and glove. So, let’s get started. 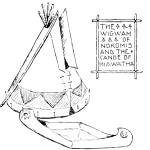 In 1620 the Pilgrims came to America from England on a 3000 mile voyage. They came here on the Mayflower and landed on Plymouth Rock. 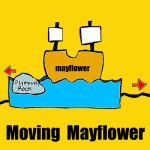 Today we will celebrate this first voyage by making a moving Mayflower for Thanksgiving. After all, if the Pilgrims never made this trip on the Mayflower there would be no Thanksgiving. I shutter at the thought. When I was a child I hated sitting at the Thanksgiving Kids’ Table. I always felt I was missing what was going on at the adult’s table. Well, I found some ideas around the internet that would change any child’s idea of the yucky kids’ table. 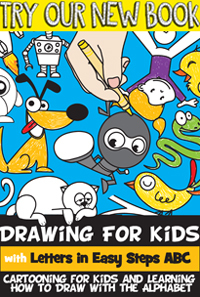 Any child would love to sit at any of these crafty and creative Kids’ Tables. I am sure you can get some ideas from these for your own kid’s table. 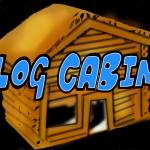 Don’t forget to leave a comment and let me know if you tried any of these ideas or if you came up with your own. Take a picture of your kids’ table and leave it in the comments so I can check it out. Thanksgiving is coming quickly and every year I’m amazed at the clever ideas people have for decorating their table tops. I was roaming the internet for interesting ideas and I came across quite a few. I was intrigued not only by the creativity, but also the fact that many of them were quite inexpensive to do. I wanted to share a few ideas that I found easy and inexpensive…. 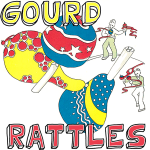 so, without further ado….. 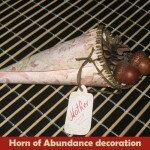 I have a great Thanksgiving craft for you that will be not only useful, but very memorable as well. 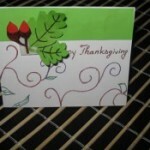 I am going to show you how to make Thanksgiving place cards. But, not just ordinary place cards…. these are place cards that your guests at your Thanksgiving feast will write down what they are thankful for. Keep the place cards as a keepsake for years to come. If you are looking for a cute game to occupy the kids during the Thanksgiving Holiday I have one for you. 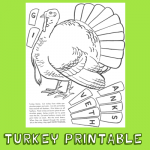 It’s a Turkey printable that is actually a game too. Simply print off for the kids and with just a few materials you should be good to go. No more bored children during the Thanksgiving football games…. just let them play the Turkey game.